To say that Anh and I like to eat out would be an understatement. We just like to eat, period. Though we also love to cook and create delicious meals at home, we love being able to go out a couple of times a week and try different restaurants. There’s so many great places to eat in Sydney that we’re more often than not exploring new restaurants. Last week I had such a craving for Indian food as I hadn’t had any since I moved. 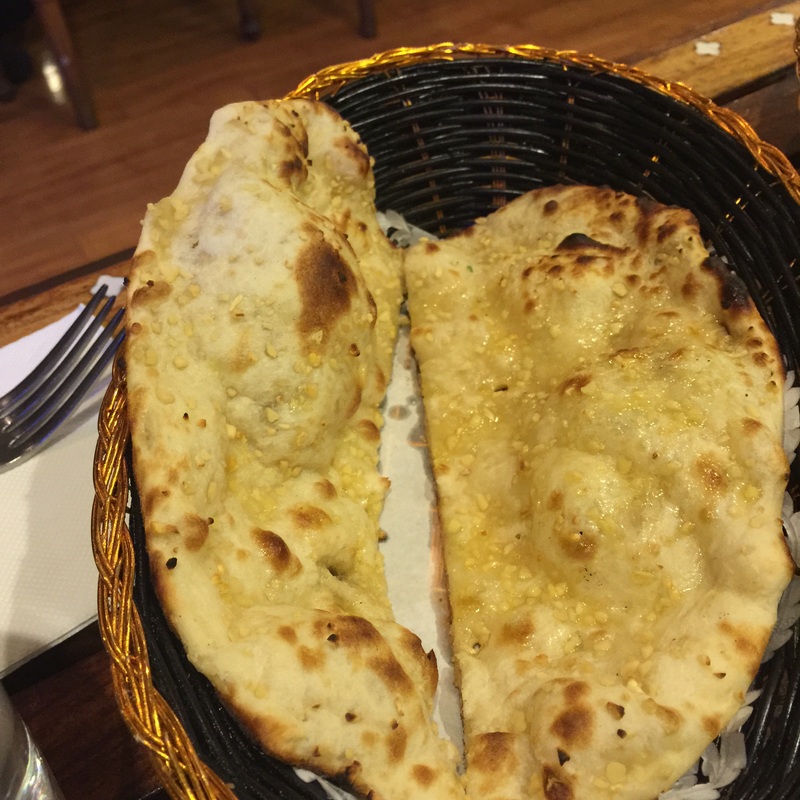 Living so close to Surrey in Canada meant I was next door to some outstanding Indian food, and so I had some pretty high expectations heading to Maharaja Palace Indian restaurant in nearby Bella Vista. They only had a few tables when we walked in, but as we were eating it got quite busy. 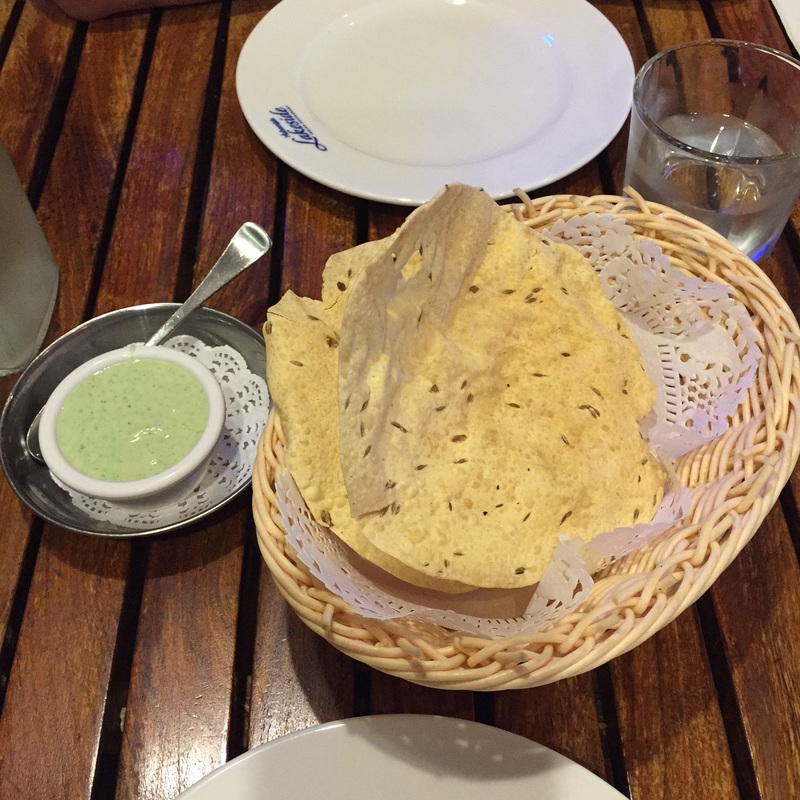 We started with some complimentary papadums, which were tasty with the dipping sauce (mint, yogurt, spices), however the papadums themselves were quite salty. 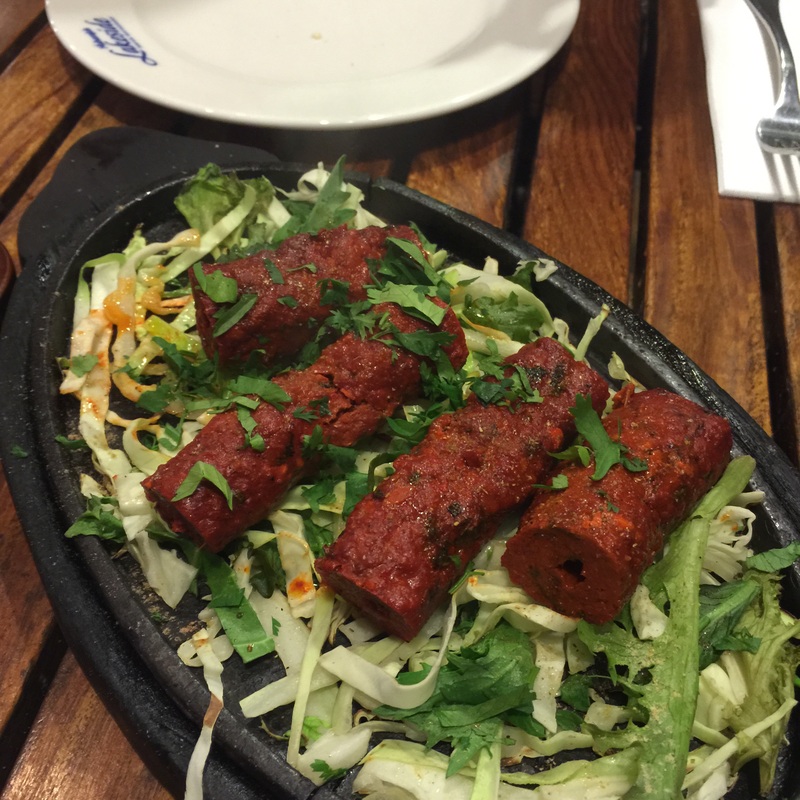 We ordered two meat dishes, some lamb kebabs and a full order of tandoori chicken. 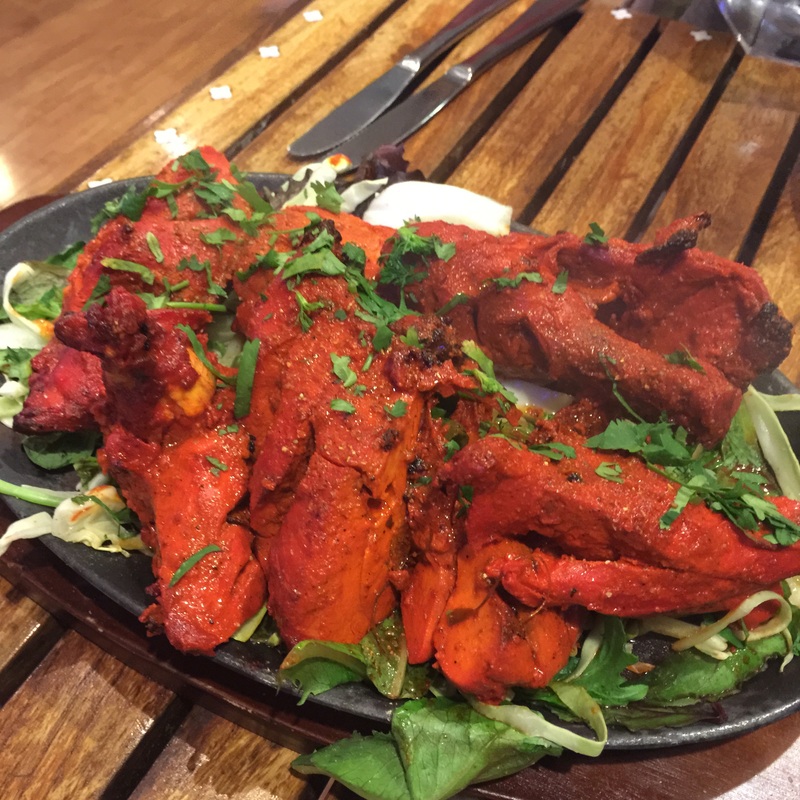 We really enjoyed the tandoori chicken, it was well spiced and still juicy, though again it was a touch too salty. The lamb kebabs weren’t our favourite as the blend of spices really overwhelmed the lamb and there were quite large amounts of ginger that was quite jarring to bite into while we were eating. 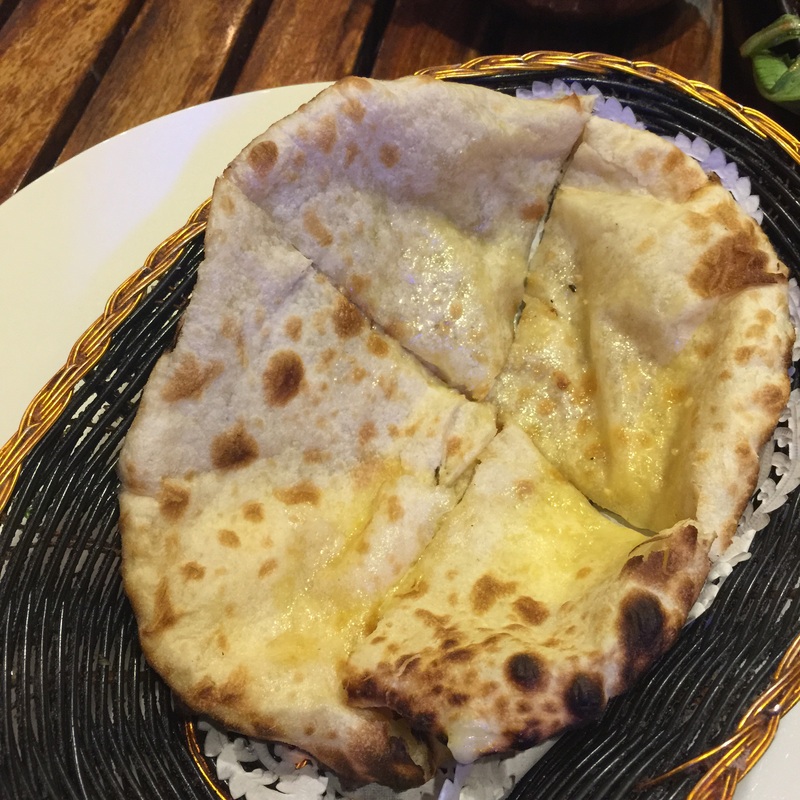 In addition to the chicken and lamb, we also ordered Palak Paneer (Spinach Paneer) and two different types of naan. 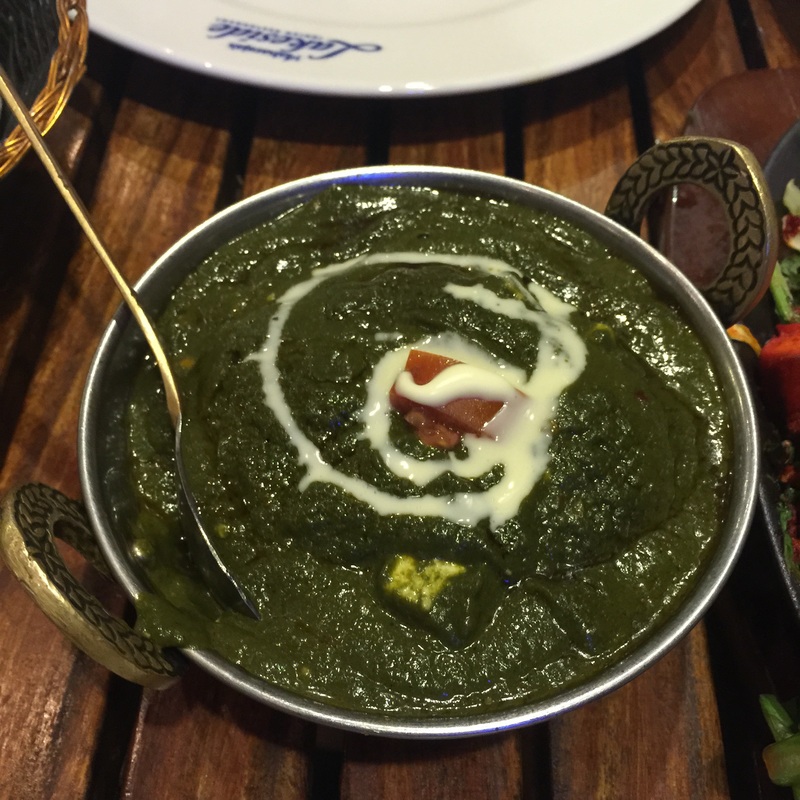 The palak paneer was creamy with an abundance of paneer, and both types of naan (garlic and cheese) were very tasty though perhaps a touch greasy. The only other complaint would be the price, as for $3.50 and $4.50 respectively we got a single naan. Overall it was a very tasty Indian meal, though all the dishes were just a touch salty. Anh reports it’s one of the best Indian places he’s been in Sydney so we’ll definitely be back when another craving for Indian food hits, though I’m up for exploring other places as well. Anyways, after the takoyaki snack and frivolous waffle machine buying we headed to PappaRich. 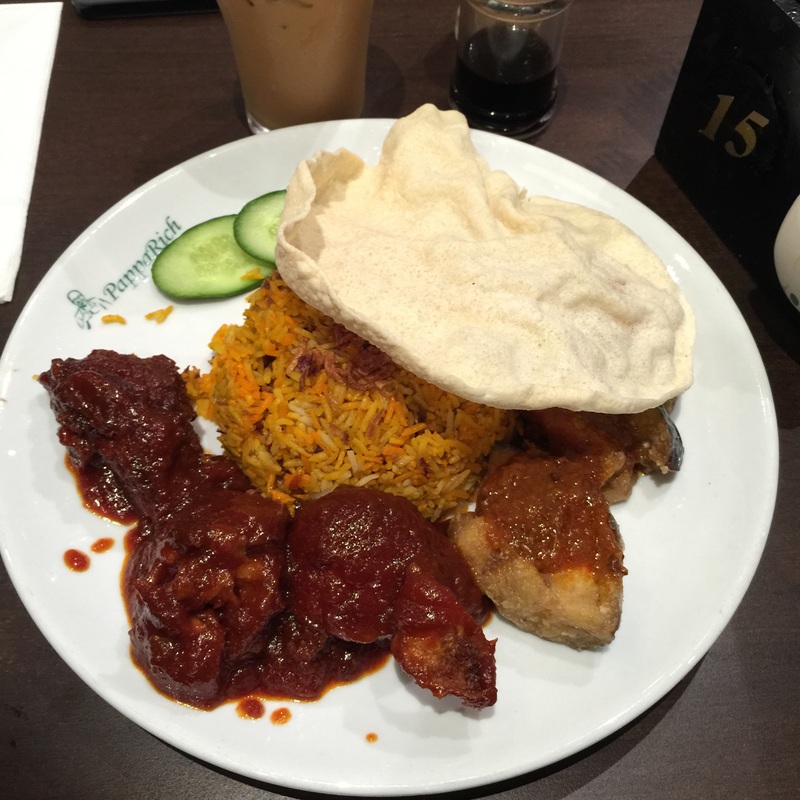 I wasn’t familiar with the very large Malaysian restaurant that has an interesting way of ordering – you write down your order on a checklist, press the button to call a server to your table and they appear seemingly out of nowhere to collect your order. It was a very popular place with people constantly streaming in and out and a great place for people watching – seeing who ordered what, and having worked in restaurants I loved just watching the workers seemingly in a constant stream of movement, picking up orders, dropping off food with utmost efficiency. 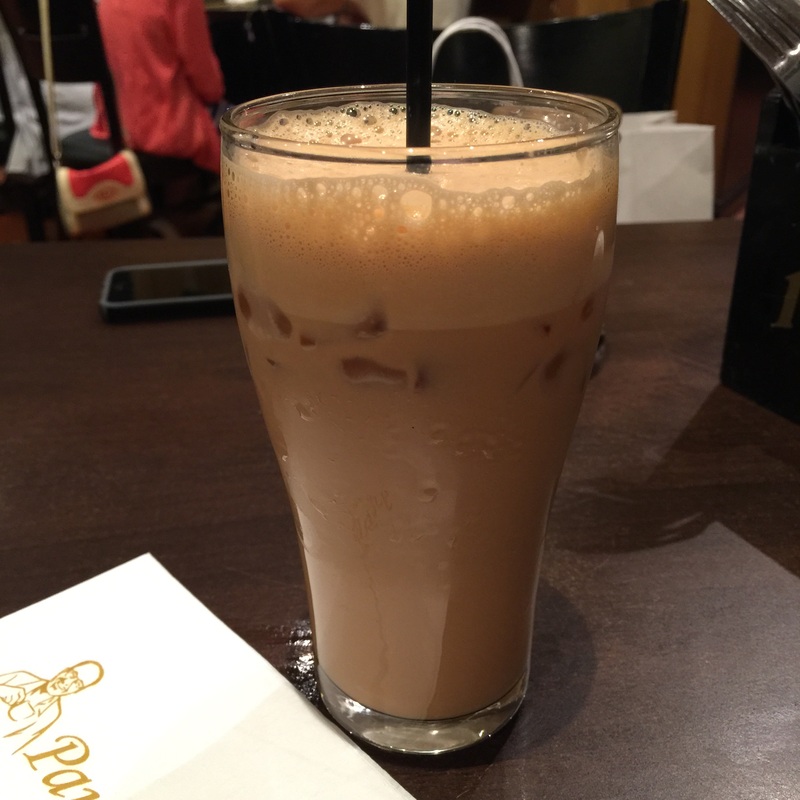 Anh started with an iced coffee, and while it looked good, it was not tasty. 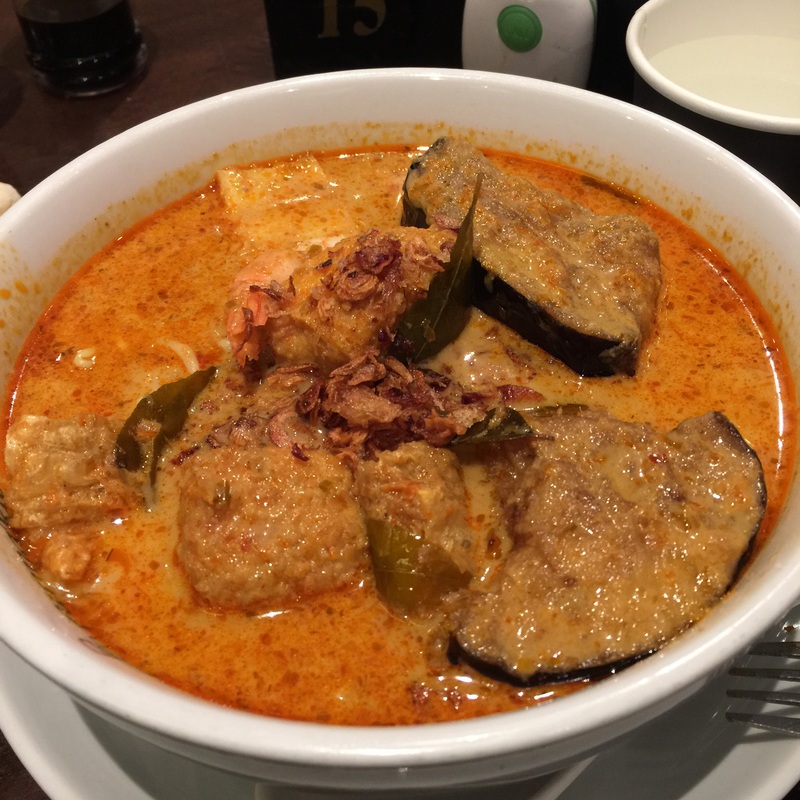 Next up, Anh ordered a rice dish, while I ordered a seafood Laksa as I was craving something soupy. Biryani rice with rendang beef and sambal eggplant. Both were great, flavourful and very generous portions. We both packed about half of our dinner for lunch the next day, and with the whole meal costing ~$35, PappaRich is definitely one of the better value for money restaurants in Sydney. The menu was very extensive with roti, other curries and rice dishes and very satisfying. Finally, yesterday I dragged Anh to a Glasshouse Candles warehouse sale. Ever since I’ve moved in, I’ve been obsessed with these scented candles and when I found out through Instagram that they were having a sale for 50% off we just had to go. Thankfully there was lots of good stock and with Christmas coming up it was very handy. As well, it was in Waterloo with lots of little restaurants so we decided to have dinner and then take a walk through the idyllic streets dotted with Jacaranda trees and beautiful walk up homes that run more than a few million dollars. We chose a restaurant through Urbanspoon, Saint Michiba’s Pizza which had a good rating. We really enjoyed our meal there, and normally we might have bypassed it as it didn’t look like anything special on the outside. The salad was delicious, even though the grilled chicken wasn’t really so much grilled as it was poached. 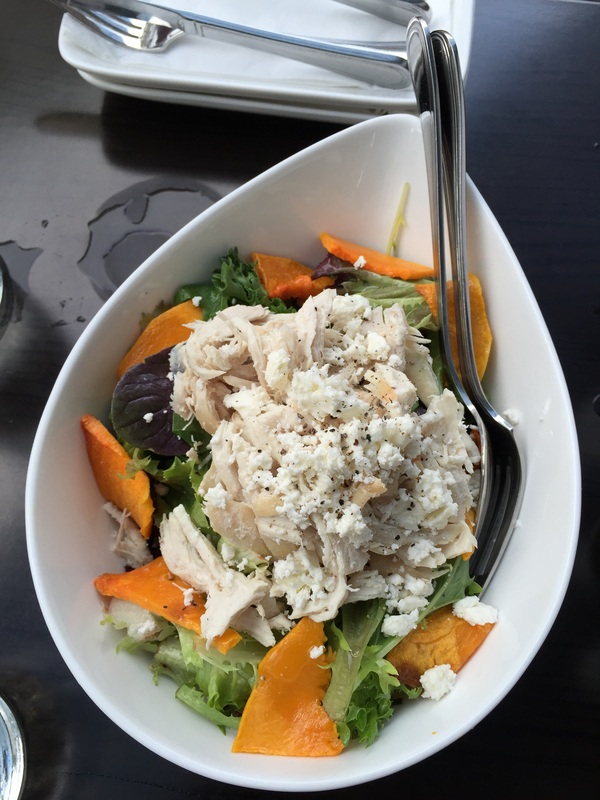 The feta add a nice saltiness to the salad and the pumpkin and pine nuts were a fresh addition to what might be a boring lettuce salad. The pizza was the stand out star of the meal. 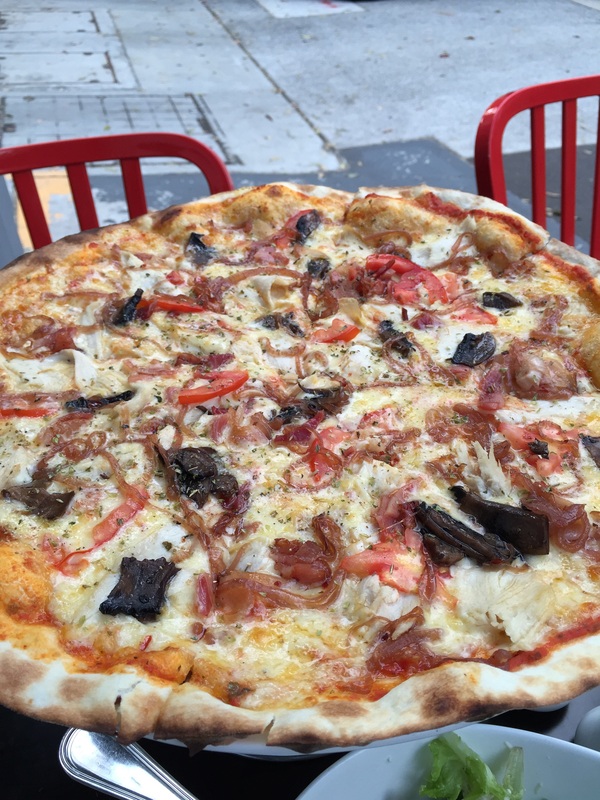 Real wood fired pizza with an ultrathin crust and great toppings. The cheese and all the toppings were well balanced for a very delicious pizza.